After our last event SOLD OUT two of the top wrestlers from the UK Millie McKenzie and 'Session Moth' Martina come to PWA, PWA Tag Team Champions The Nations and TMDK will cross paths and we'll see the fallout from Wahlberg and Ugg's unbelievable Heavyweight Title match. Matty Wahlberg after fending off Jax Jordan and defeating Jimmy Havoc had his challenge accepted by Caveman Ugg at Black Metal which means only one thing... ITS ON LIKE DONKEY UGG!!!!!! It started with 8 of the finest grapplers in Australia and now FINALLY the ultimate match of the Colosseum tournament will take place Friday February 22 between tag champions, Jack J, Bonza and Mick Moretti! This 18+ event will contain violence, drinking, swearing, adult themes and beer pong. Tickets will be released next week! Make sure you get yours early. Last years Call to Arms saw Robbie Eagles vs Will Ospreay which helped put Australian wrestling on the map PWA's 11th Anniversary event CALL TO ARMS could be event BIGGER! Not only will we welcome Bea Priestley and WILL OSPREAY back but our main event will be JONAH ROCK VS CAVEMAN UGG FOR THE PWA CHAMPIONSHIP IN A STEEL CAGE MATCH! The PWA Heavyweight Champion Robbie Eagles takes on one of his biggest (literally) challenges to date 'The King of Monsters' Jonah Rock in what will be an epic main event. See current Progress and WWE performers against the best wrestlers Australia has to offer at The Star, Sydney. IWGP Jr. Heavyweight Champion Will Ospreay returns to Pro Wrestling Australia LIVE at Paddo RSL in Sydney. PWA - Black Label presents: O'DOYLO RULES! 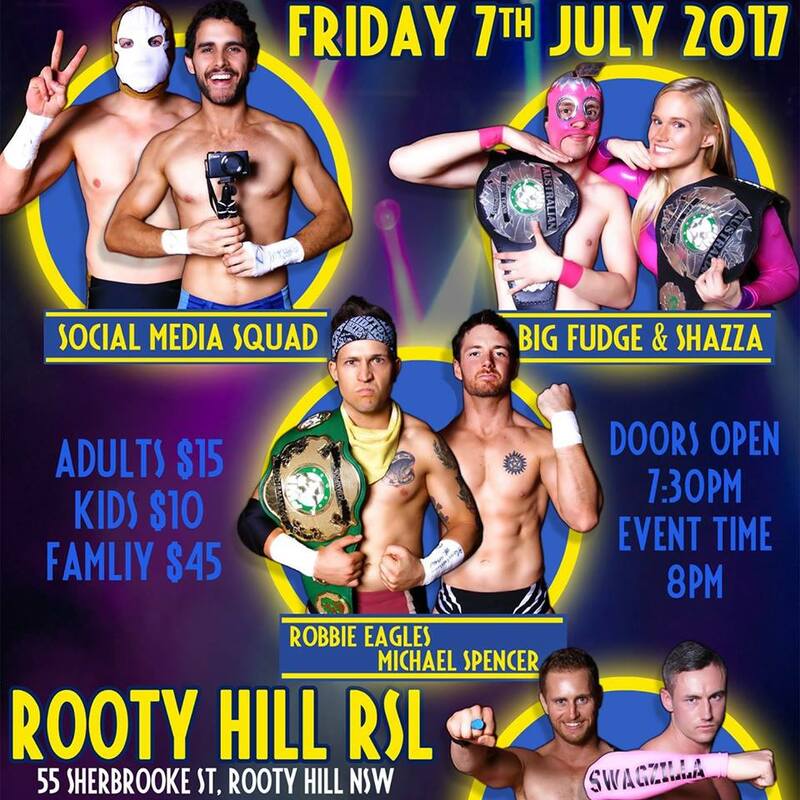 Pro Wrestling Australia - Black Label will have violence, coarse language, beer pong and of course top level pro wrestling action! A wrestling event that's not recommended for kids. PWA Heavyweight Championship - NO DQ! *Warning: PWA - Black Label events contain swearing and adult themes. It's not recommended for younger viewers. Pro Wrestling Australia - Black Label will have violence, coarse language, alcohol and of course pro wrestling action! A wrestling event that's not recommended for kids. The night will also feature Bullet Club members The Under-boss Toks Fale and Gino 'Mr Juicy' Gambino. PWA returns to Casula Powerhouse! This event will feature the best wrestlers in Australia going at it in hard-hitting, high paced wrestling action! This event is a family-friendly event suited to kids of all ages! Tickets are now available through http://rootyhillrsl.com.au , or at the venue box office. We are not able to reserve seats, seating selection is made through Rooty Hill RSL. TICKETS ARE NO LONGER AVAILABLE ONLINE, TICKETS ARE AVAILBLE FOR PURCHASE AT THE DOOR TONIGHT! Stay tuned for more information regarding our end of year finale! PRO WRESTLING AUSTRALIA comes to the Rooty Hill RSL Club THIS SCHOOL HOLIDAYS Sunday the 25th of September 2016. The event will feature High Flying, Hard Hitting wrestling action including Championship matches, Women’s action and a Tag Team contest! It’s a special family friendly event for the school holidays, the kids can meet the wrestlers and get their face painted if they get there early! Scheduled to appear are Caveman Ugg, Big Fudge and the Social Media Squad! NO PRE-BOOKINGS WILL BE ACCEPTED THROUGH FACEBOOK! Pro Wrestling Australia comes back to the Casula Powerhouse Arts Centre for a huge event - Suicide Dive Squad! The Resistance stood up and bested the 4 Nations in a 5 on 5 tag team war in Cabramatta, this sees the end of the Robbie Eagles vs 4 Nations chapter. However there are still more stories to be told, and endings to be had. The Blue Oni was unmasked, revealing social media star Unsocial Jordan to be under the mask. What does this mean for the Harajuku Hipsters and their tag team championship reign? Shazza McKenzie and Adam Hoffman are still at each other's throats, now becoming more physical than ever. The PWWA co Champions of Charli Evans and Jessica Troy continue to abuse their dual-champion rule to get the upper hand against many of Australia's best female competitors. Most importantly, Bishop Sommers fought against Jack Bonza on his own will. Come see all the action as it takes place in a historical setting for PWA. The Powerhouse has seen many epic battles, and this will be no different. EXCITING TIMES! PWA debuts at a new location - Cabramatta Rugby Leagues Club in South-West Sydney!